Higher Education – Introduction of (4) years Integrated B.A. B.Ed./ B.Sc. B.Ed. courses in  Private Colleges in the state from the academic year 2018-19 - Orders – Issued. 2. From the Secretary, APSCHE Lr No. APSCHE /AC/ B.A. B.Ed & BSc. B.Ed/2016, dt:28.08.2017. 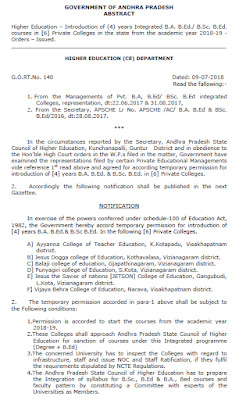 In the circumstances reported by the Secretary, Andhra Pradesh State Council of Higher Education, Kunchanapalli, Guntur District and in obedience to the Hon'ble High Court orders in the W.P.s filed in the matter, Government have examined the representations filed by certain Private Educational Managements vide reference 1st read above and agreed for according temporary permission for introduction of  years B.A. B.Ed. & B.Sc. B.Ed. in  Private Colleges. 2. Accordingly the following notification shall be published in the next Gazettee. In exercise of the powers conferred under schedule-100 of Education Act, 1982, the Government hereby accord temporary permission for introduction of  years B.A. B.Ed.& B.Sc B.Ed. In the following  Private Colleges. A] Ayyanna College of Teacher Education, K.Kotapadu, Visakhapatnam district. E] Jesus the Savior of nations [JETSON] College of Education, Gangubudi, L.Kota, Vizianagaram district. 1.Permission is accorded to start the courses from the academic year 2018-19. 3.The concerned University has to inspect the Colleges with regard to infrastructure, staff and issue NOC and Staff Ratification, if they fulfil the requirements stipulated by NCTE Regulations. 4.The Andhra Pradesh State Council of Higher Education has to prepare the Integration of syllabus for B.Sc., B.Ed & B.A., Bed courses and faculty pattern by constituting a Committee with experts of the Universities as Members. 5.The Andhra Pradesh State Council of Higher Education has to identify the Government Agency to conduct entrance test and admissions are to be made on merit based as per the marks awarded in the entrance Test. 3. The Secretary, Andhra Pradesh State Council of Higher Education shall take further action accordingly.